Even though I'm single, I've always had a special place in my heart for Valentine's Day ever since I was a kid and did those little card exchanges back in grade school (we were all in this together back then, good times right?). I don't know if it's all the pink and red everywhere or the fact that my birthday is the week afterwards, but it's just such a cute holiday. I always like to treat myself (okay, when do I not treat myself? haha) to a gift or two if I don't have a Valentine (which is like, always) and usually treat my Mom as well because this holiday isn't just about your significant other. It's about spreading love all around! My go-to place is defiantly Kate Spade and their new Rose-Colored Glasses collection has already become my new love. 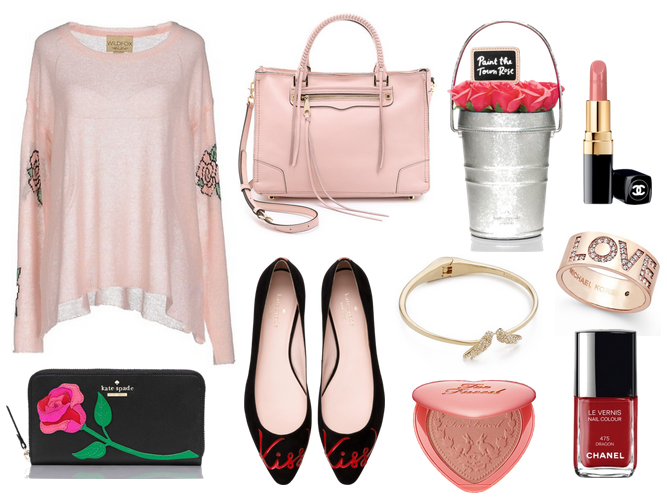 I mean come on, just look at that bucket bag with the roses in it! A-D-O-R-A-B-L-E. And that wallet. I need that asap. Okay, I'm gonna stop now cause I'm getting carried away haha.